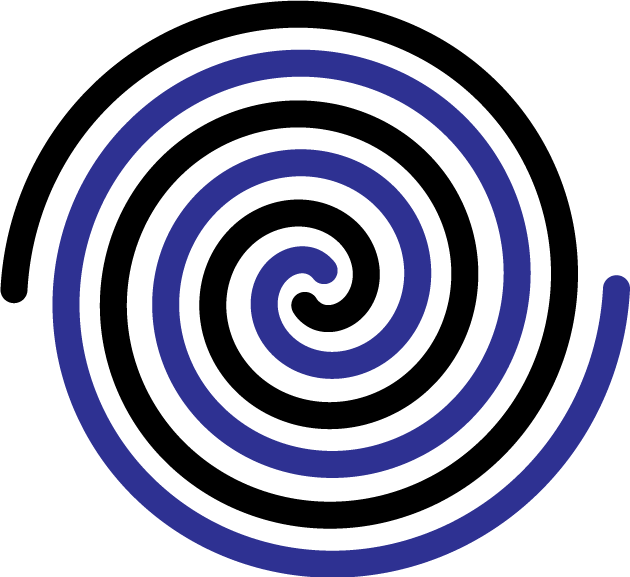 As the first wave of early adopters casts on their Double Heelix projects, another question many of them have been asking is: "how do you keep those 4 strands from becoming a tangled mess?" Well, it does take a little doing, but less than you might think. There are three things I do that seem to keep the tangle at bay. 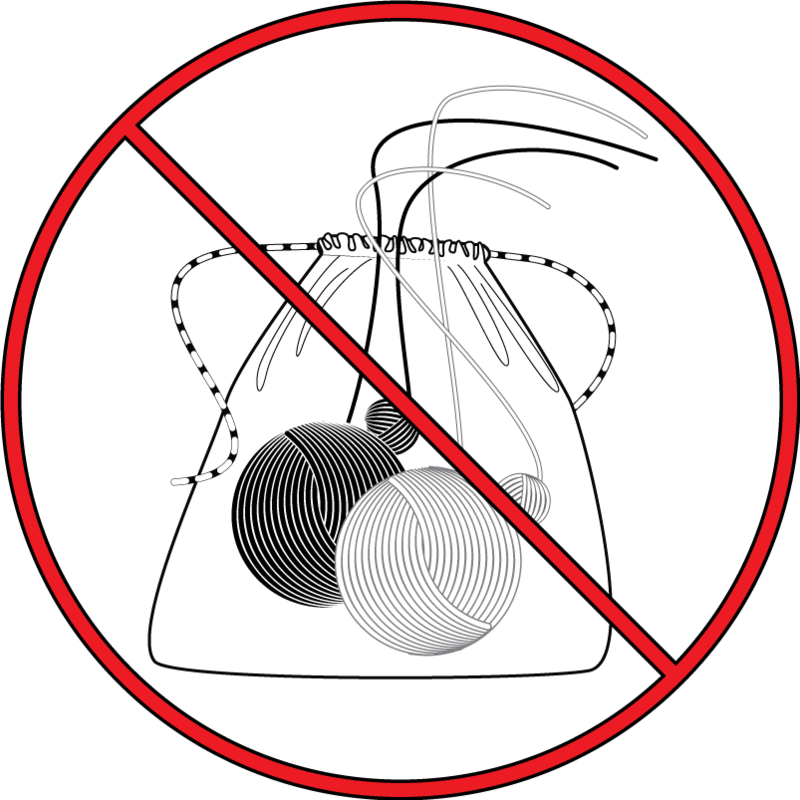 #1: Maintain consistent yarn positions relative to the work. This project is not a good one to knit while on the go. You can't toss all your yarn into one bag or basket without asking for trouble. 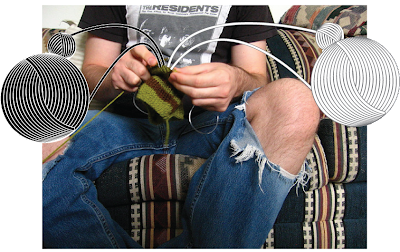 Your yarn 4 balls would be placed like so, relative to your work (and your person). #2 Twist your work in the opposite direction that the yarn twists. As demonstrated by this quick (0:20) Youtube video. 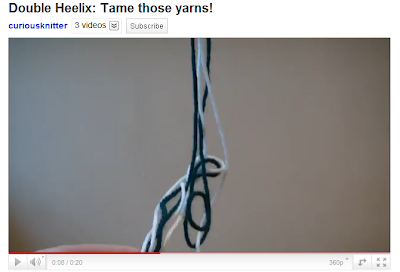 The little balls of yarn should be small enough that you can unwind them and pull the all the way out of the tangle. Then you can manually disengage the 2 large yarn balls from each other, and then wind up your small balls again. Keep those questions coming, and I'll get to 'em as soon as I can! Double Heelix went live three days ago, and I've been thrilled with the reception! Here is a YouTube demo video I just put together, which walks you through the cast on and the first 2 cycles of the heel. It's definitely a challenging sock project to tackle, and I hope this makes it easier for knitters to get over the inital learning curve. The day has arrived. Knitty is up! 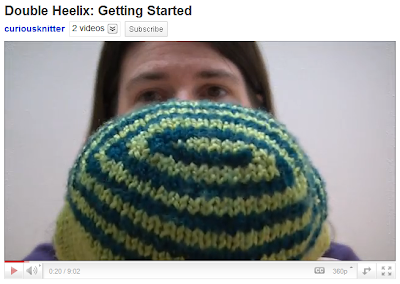 If you visit this article from the latest issue of knitty.com, you'll see a project that has been long in-the-making. The design in the article is a version designed for high contrast, semisolid yarns, but there's more than one way to wrap a helix around a foot! You'll recognize the knitty socks here (I'll call them "Flavor 1"), along with another flavor, kindly modeled by my sister-in-law. In Flavor 1, the 4 strands that make the heel reduce to 2 at the ankle, which then split off to work either the cuff or the toe. The helix knitting ends at the ankle and the rest of the sock is stockinette worked in the round. In Flavor 2, all 4 strands used for the heel continue to make the rest of the sock, but the 4 strands split into 2 sets at the instep. 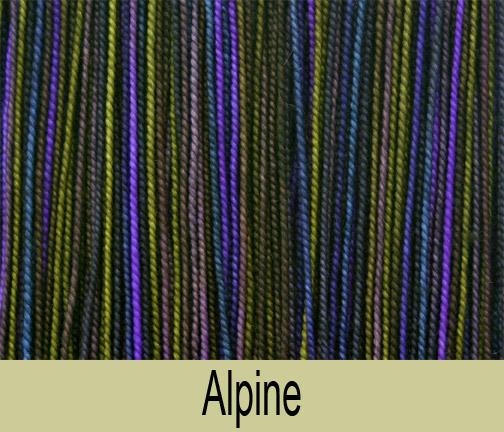 1 strand of each color is worked in either direction, which changes the bold helix into a pinstripe helix. 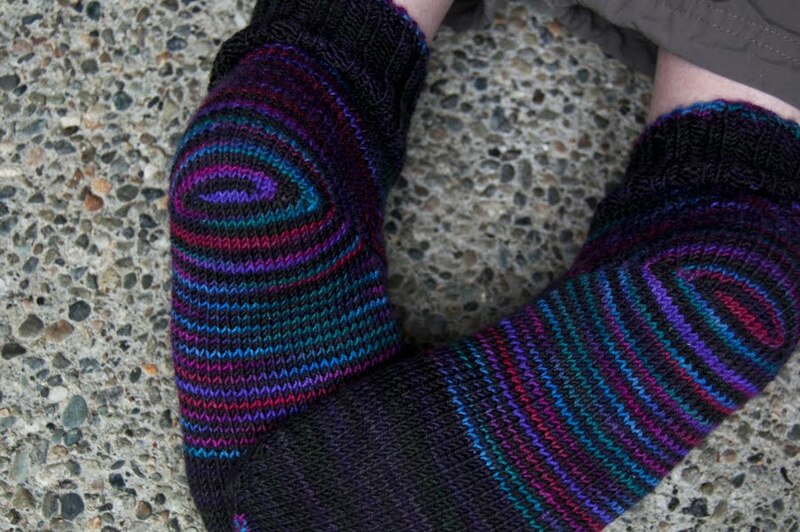 Flavor 2 is made with Blue Moon lightweight sock yarn, in colors Bejewelled and Korppi. The gauge for this yarn is slightly larger than that of Shibui/Koigu (I get 7.5 st/inch with BMFA lightweight and 8 st/inch with Shibui/Koigu). 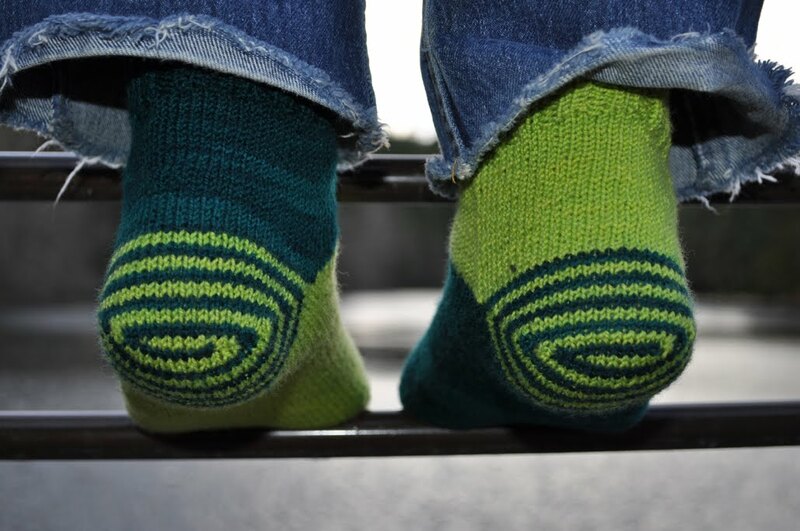 But if you are knitting for a medium, large, or extra-large foot, all you have to do is follow the knitty instructions for the size below the one you're making. Size S using Blue Moon will yield a medium-sized sock, and likewise, size M made with Blue Moon will yield a large-sized sock. 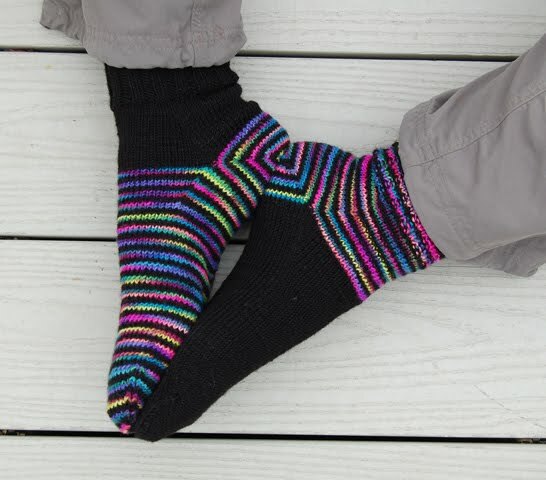 I affectionately call these socks "Double Heelix On Acid" because they are made with a Rockin' Sock Club yarn called "Electric Kool-Aid Acid Test" (some readers may recognize it). The yarn was so bright, I thought it would benefit from some contrast with black, and this is where I ended up. 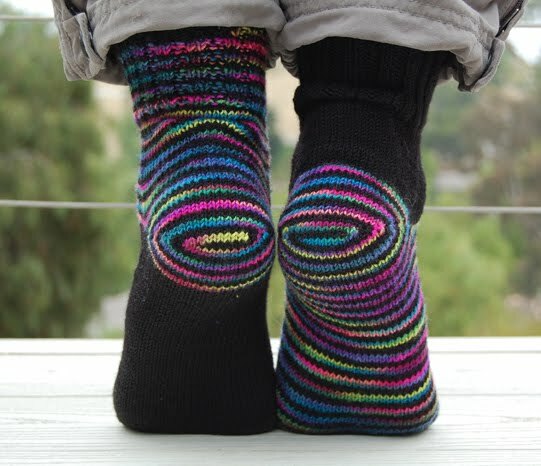 In this flavor (Flavor 3), after you finish working the heel, all 4 strands continue to make the next part of the sock. It doesn't matter whether you carry the 4 strands into the foot or the heel, so I made one of each! Sizing with Flavor 3 is as with Flavor 2, since it also uses Blue Moon Yarn. Actually I'm not sure what I used for the black, it was something in my stash that matched the gauge. But if I were to pick a Blue Moon yarn it would definitely be Shadow. There are yet more ways to explore this topic, and as I make my way through them, I will share them with you. Thanks for reading! 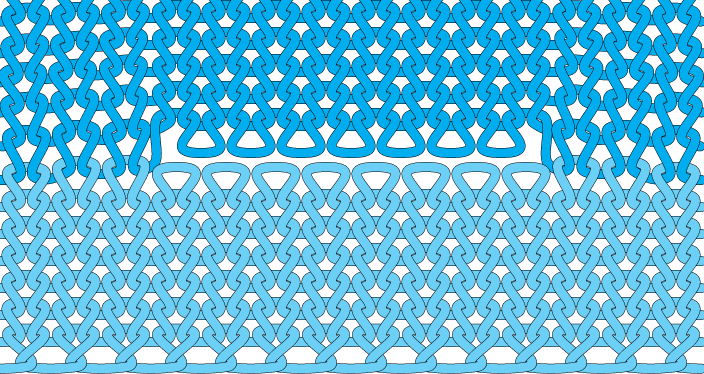 I've done a lot of thinking about how intersecting knitted parts fit together. 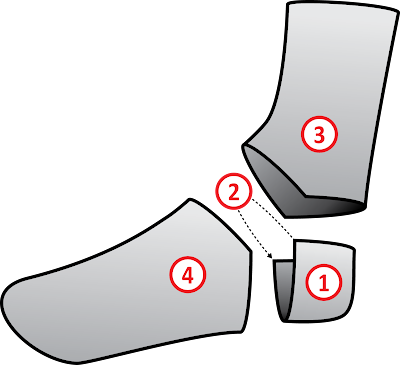 Sock parts in particular. Like many knitters, I got holes at the corners whenever I picked up provisional sts, as you would with an afterthought heel. Not anymore! Getting a neat join with a provisional cast on is a key component of many patterns I'm currently working on, so I thought I'd offer some basics as a reference. One makes afterthought heels (or glove fingers, or moebius baskets, etc.) by knitting some of your live sts with scrap yarn, then knitting over these scrap yarn sts with working yarn. Later, one un-picks the scrap yarn and continues with a new strand of working yarn, and works the heel. That's it in a nutshell. 1. 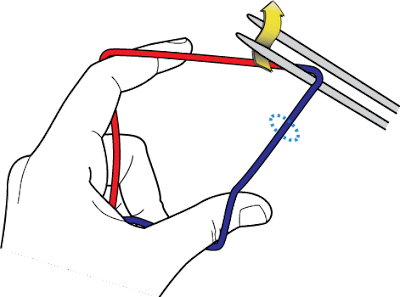 Decide where your opening is going to be, and how many sts will need to be picked up later (e.g., about 16 sts for a glove finger). Divide the number in half. That's the number of stitches you're going to mark with scrap yarn. 2. Knit the selected sts with scrap yarn (in this case, 8 sts). 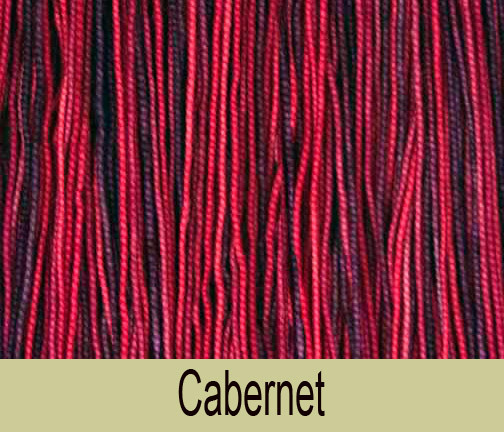 Once you've finished the section on top of the scrap yarn, you'll come back and remove the scrap yarn. As you un-pick, you would of course put the live sts onto your needles (light blue sts on one needle, dark blue on another needle). In my illustrations, I've purposely left the needles out. Just pretend they're there. 5. Here's the fabric with scrap yarn removed. Now let's take a closer look at the provisional sts, just above where the scrap yarn was. When you knit these earlier, you had 8 loops going up, indicated by the red arrows. 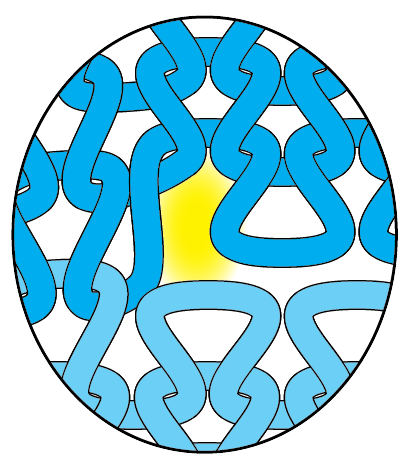 (Note that the 8 sts on the bottom of the opening, in light blue, also line up with these arrows.) 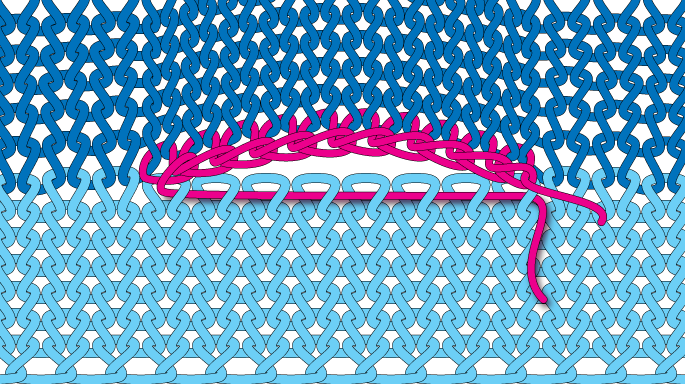 Now you're going to pick up the loops from the underside of the provisional row and knit in the other direction. 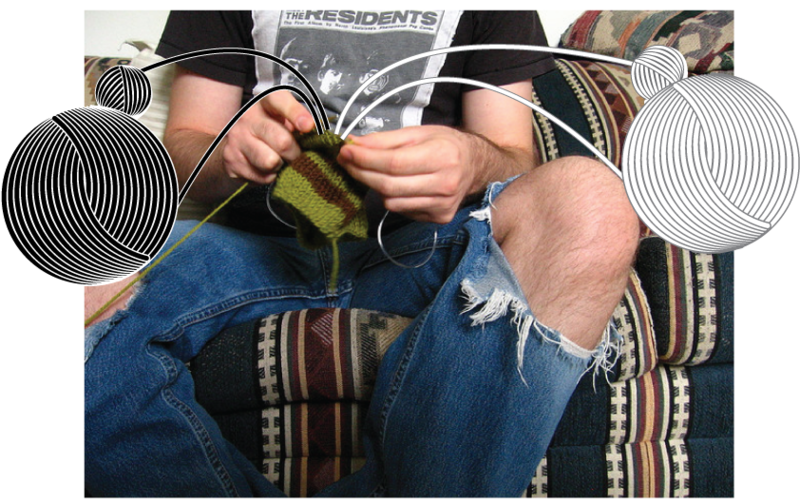 The black arrows indicate the direction you'll be knitting those loops. Note that there are 7 live loops on the underside of the provisional row, one fewer than you had on the top. 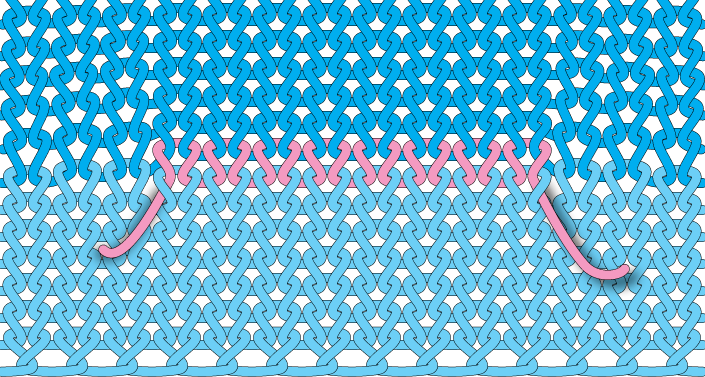 That's because the top and bottom of the provisional row are offset by 1/2 stitch. And that brings up a little problem... see those holes on the outer edges where your scrap yarn was? An easy way to tighten up this area is to pick up the sts on these edges, marked in green below, and put them on the needle with the dark blue sts. 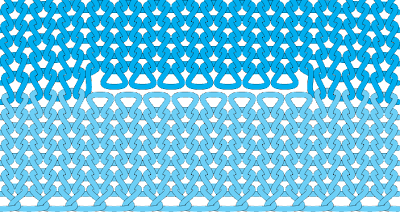 Now you have one more stitch on the top than you do on the bottom, for a grand total of 17 sts around. 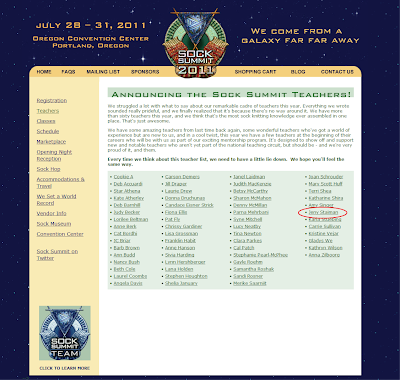 Voila, a much better join! So far we've been talking about picking up provisional sts by knitting a partial row with scrap yarn, then knitting your provisional sts right over it. This is all well and good, but it limits you to having approximately the same number of sts on the top and bottom of your opening. What if you want to have more sts on one side? Let's say we want to have 10 sts on the top, and the same 8 sts on the bottom. 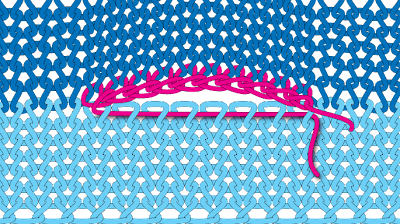 Rather than knitting those 8 sts with scrap yarn, just run a length of scrap yarn through them to act as a temporary stitch holder. Next, cast on the desired number of sts with scrap yarn (e.g., 10 sts). 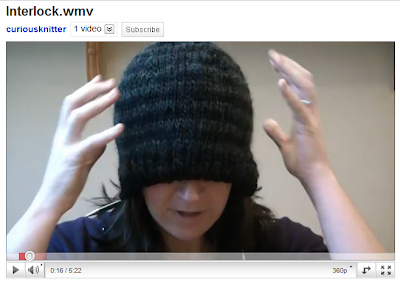 Lucy Neatby has an excellent video on how to do this kind of provisional cast on. 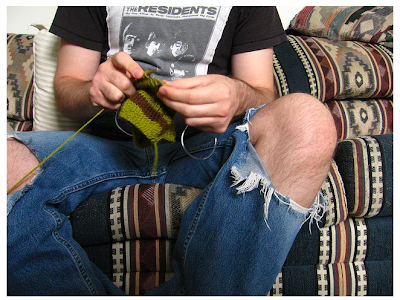 Next, knit over your cast on sts in the next row. 10 red arrows indicate the provisional sts and the direction you're working. Now when you come back and un-pick your scrap cast on, you'll notice that, assuming you pick up the end sts, you will have 11 sts going in the other direction, marked with the black arrows. 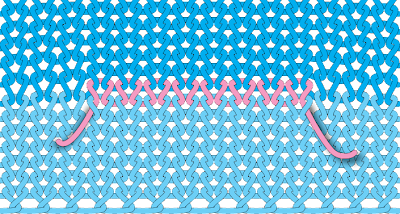 The 8 sts in the row below that were held with the scrap yarn are conveniently waiting for you to pick them up again, giving you a total of 19 sts around. So in either case, if you have (x) provisional sts, you will have (x) going up and (x+1) going down, assuming you pick up the end sts. I will note that I do still get little holes at the corners even when I pick up the edge sts. I typically get rid of the holes by distributing the extra slack along the adjacent sts. That way there's no need to use a strand of yarn to close the hole. Some knitters pick up additional sts and knit them together. Do whatever works for you! 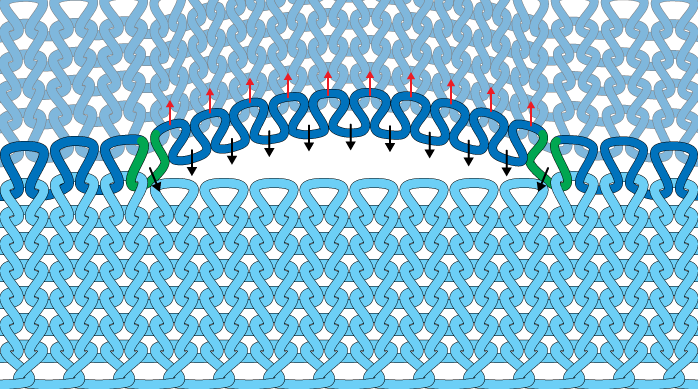 2. the graft starts on the side with the greater number of sts. A bit over a year ago, I posted my version of Judy's Magic Cast On, which is very similar to the traditional version except that I start on the bottom needle. My original post is here. Then sometime after that, I re-engineered the first step, to make casting on easier and to make the end result neater. In the meantime, I also got some more practice using Adobe Illustrator. So I now present to you some updated illustrations of this excellent provisional cast on brought to you by the extremely clever & creative Judy Becker. 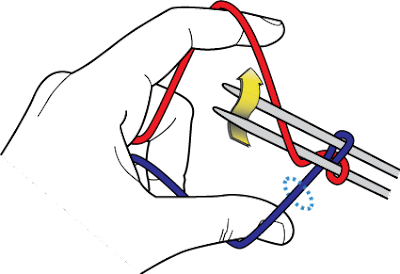 In the illustrations below, blue indicates the working yarn, held with the thumb and wrapped over the top needle. 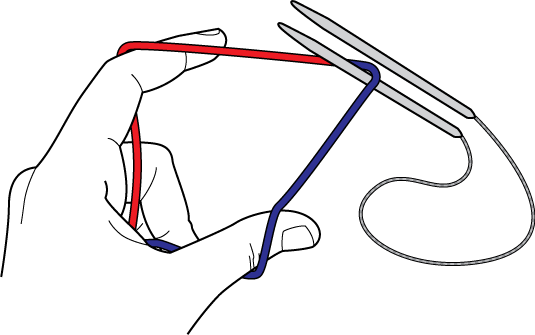 Red indicates the tail, held with the forefinger and wrapped over the bottom needle. Position the 2 tips of a circular cable pointing to the left, and wrap the yarn around the bottom needle like so. (This will become your first cast on stitch.) 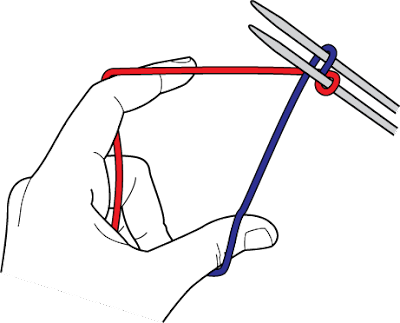 Hold the working yarn with your thumb. Hold the tail with your forefinger. Step 1: Cast on the first top stitch. Bring the working yarn up behind the bottom needle and in front of the top needle. 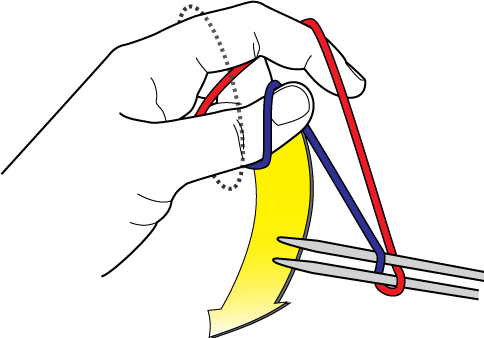 Now swing your hand down behind the needles, as shown by the arrow. This will bring the working yarn over and around the top needle. The result will look like this. You have now cast on two stitches: one on the bottom needle, and one on the top needle. 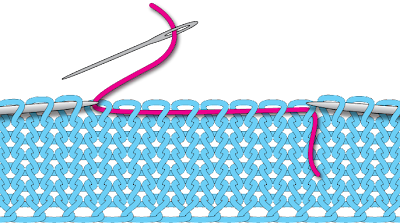 Step 2: Cast on the next bottom stitch. Bring the tail up in front of the bottom needle and behind the top needle. Step 3: Cast on the next top stitch. 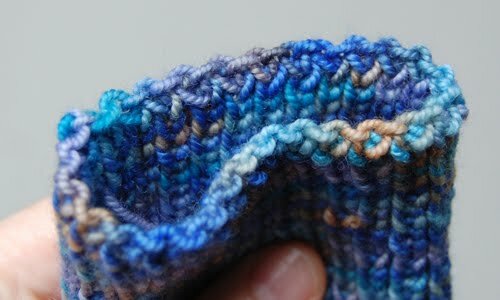 Bring the working yarn up behind the bottom needle and in front of the top needle, just as you did in Step 1. Swing your hand down behind the needles... ...and you will have two stitches on each needle. 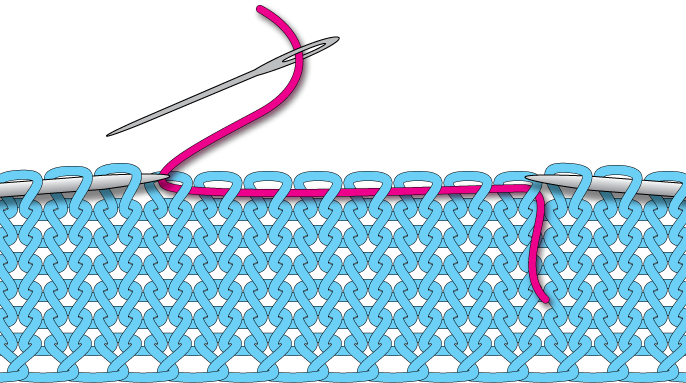 Repeat steps 2 and 3 until you have cast on the desired number of stitches. Then you can continue to knit with your working yarn.